Chances are you want to stay sharp well into your golden years. Whether it’s not being able to remember where you put your glasses or needing to rack your brain for a simple word that should come easily, if you’re getting older, memory is probably on your mind. New research indicates Omega-3s may be just what you’re looking for. Brains need oxygen. After just one minute without the stuff, brain cells begin dying. And after five minutes, death is on the horizon. [i] Anything you can do to increase your brain’s supply of oxygen will likely enhance its function. A 2018 study, published in the journal Nutrients, followed 38 volunteers who ranged in age from 40 to 85. Half the group took an Omega-3 supplement with 1,600 mg DHA and 400 mg EPA every day, while half took a corn oil placebo. But that doesn’t diminish the study’s value. 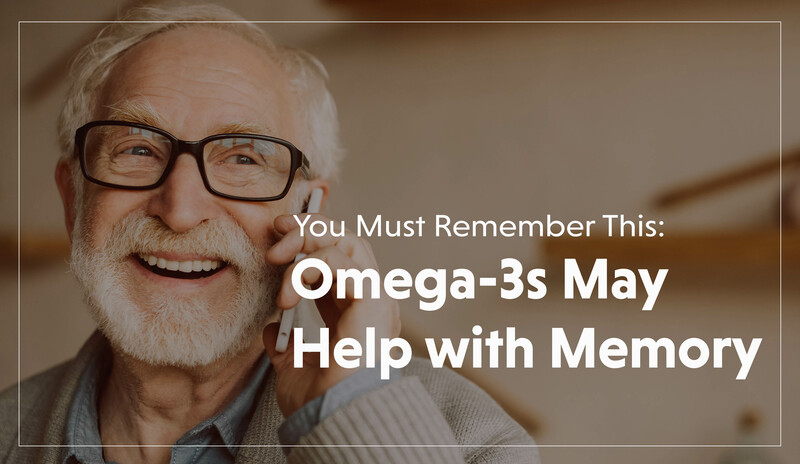 Overall, it echoes the results of an earlier, observational study that found folks with higher blood levels of DHA and EPA had better blood flow to the brain. [iv] While there’s no silver bullet for memory, emerging research suggests Omega-3s might be a piece of the puzzle. So, keep eating your fatty fish and taking your flax oil or try a high-quality fish oil supplement. Your brain will thank you. [iii] Howe PRC, et al. Nutrients. 2018;10(10):1413.